After an agonizing wait, Chris Lee's second Urbanite, Mellow the gentle confectioner, is set to be released in Late May/June in four hand-numbered colorways from Wheaty Wheat Studios. The standard colorway with green jello accessory is limited to 660pieces and will drop in late may for a suggested retail of $69.99. Decked out in white with a special 'smores' accessory is the 3DRetro exclusive Marshmellow variant. Marshmellow is limited to 300 pieces and will be released on May 31st for $79.99 at a very sweet and currently undisclosed location. 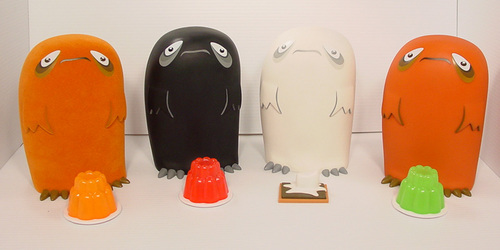 The black Licorice and Love edition w/red jello, a myplasticheart exclusive, is the rarest Mellow limited to just 84 pieces and will be released in June for an SRP of $89.99. 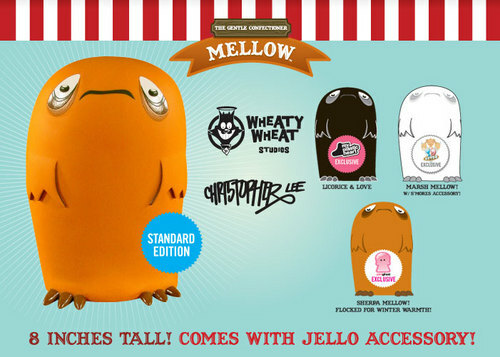 Rounding out the editions, the flocked Sherpa Mellow w/orange jello,exclusive to Pink Ghost and Friends, is limited to 180 pieces and will be released in June. That's alot of detail, but the key is Mellow is just around the corner. Great Job Chris and Wheaty Wheat - 3D Retro & Plastic Heart versions my favorites!